A product with the “Made in the USA” tag is more than a slogan, as it represents the manufacturing capability of the country. And according to an infographic from Standard Textile, US manufacturing drives more innovation than any other sector in the country. The infographic is titled, “Advanced U.S. Manufacturing: Strengthening Communities and the Economy.” And it points out how quality manufacturing using advanced technologies affects the overall economy and gives US companies a competitive edge. This competitive edge comes in the form of consumer preference. According to the infographic, 80% prefer products with the “Made in USA” tag. So much so, 60% of Americans said they are willing to pay 10% more for products made in the country. One of the reasons for this preference is quality. Sixty-six percent of Americans said they associate “Made in the USA” with high quality. Compared to the US, China had more than double the number of product recalled by the Consumer Product Safety Commission. In 2016 China had 179 and the US 73. Advanced manufacturing in the US is responsible for more than 75% of all private sector R&D, which drives more innovation. These innovations, in turn, create new high paying manufacturing jobs, with an average of $26 per hour. Overall, US manufacturing employs 8.5% of the workforce with a total of 12.5 million people which include jobs for workers without college degrees. When it comes to return on investments, manufacturing adds $1.89 for every dollar spent in the sector. The National Association of Manufacturers (NAN) says the total multiplier effect for manufacturing is $3.60 for every $1.00 of value-added output. It goes on to say one manufacturing employee generates another 3.4 workers elsewhere. According to the NAM, the vast majority of manufacturers are small firms. Of the 251,774 manufacturing companies, only 3,813 are large enterprises. In fact, the NAM says three-quarters of the firms have less than 20 employees. For these small firms, the implementation of new technologies and innovative manufacturing processes are essential for being able to compete globally. 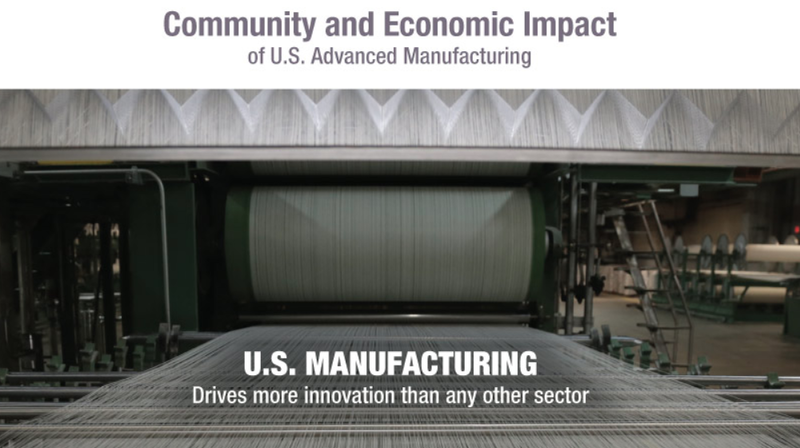 You can look at the rest of the data on the Advanced U.S. Manufacturing: Strengthening Communities and the Economy from Standard Textile below.